Can you offer this 4 year old blue boy a loving home? He is in need of some fun and love and the obvious few treats and he would take a bit of food and a cuppa tea too - Chicken dinner would be fine .... yorkshire puds? He is on a bit of a special diet as he does not like dog food as in tinned meat! Nor does he like any kind of ‘wet’ foods! But this lad is so very loving, kind, absolutely melts your heart and he is such a good boy you will not know you have him! Oh... move up on the bed though... he likes to be comfy! Now Bruce, does go on walks with other greyhounds but is kennelled alone because he does like his own kennel space but this is only due to his unusual food preferences and for this reason alone we are re-homing him as an only dog so no other pets and as we have mentioned recently only children 10 or over will be considered. Meet Billy The Brave - Still looking for his new home?! Billy is a gorgeous black male greyhound who anyone will just fall in love with! Can I just say something about Billy - he is just wonderful! He reminds me of Gamble my first Greyhound from Karen although a little smaller in size he is so very calm, loving and just no words ca describe this joy of a lad! If I was walking through these kennels (I know I love them all but he would melt me)! He can go with a female too! He is amazing! He is new into rescue and waiting for his new family to find him and show him what life is really all about....love, play and sleep....food! He will give love and fun back in bundles! A wonderful boy and to watch any ex racing greyhound learn the new experiences of what we have all taken for granted with normal pet dogs such as 'play', is the most wonderful experience for any owner, new and old owners. Billy will make someone the ideal pet. Holly - has been reserved! 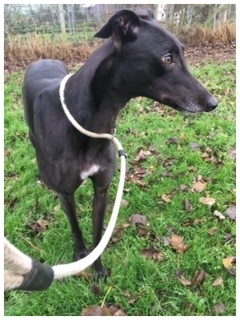 Holly is a 4 year old black female greyhound who has just retired from racing. She was ‘Gentleman Bens’ kennel mate whilst in the racing kennels although he has been here with us a little while now awaiting his forever home! 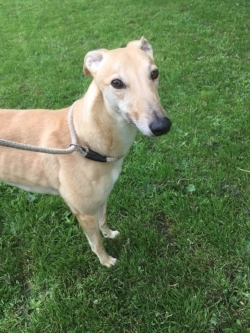 Holly is a very calm girl and looking for a nice relaxing long comfy life of luxury! Or a few good meals and treats and a sofa & duvet will be fine!!! She will love, play, cuddle, aim to please and all she will want in return is your love. If you want to melt your heart and fill your life with a love like no other then - a greyhound is for you and Holly is waiting. Contact Dawn or Karen on 07811 296029 or 01205 290145 or email dawn@greyhoundrescue.org.uk - Holly has been reserved! Before we talk to anyone about Lucinda we need any potential adoptors to know that whilst a beautiful loving girl, gorgeous colour etc, Lucinda has got issues!!! She is not used to pet dogs and has real problems with small dogs and is strong on lead. We therefore are being careful about homing her as needs to be to a previous greyhound owner who can continue to work with her. She is fine with bigger dogs and one a small dog barks and she realises what it is!!! So please call if you are serious and have got the time to help with her only. Looking for her forever home. She is 3 years old (4 in Oct) and would really like to snuggle up on a sofa as soon as possible! Now this little girl has been quite a hit with the boys in the kennels! Edgar, Ben and Billy have all taken a shine to her - not to mention Drac and Helsin! She is a really kind, loving, playful and sweet girl! You will just love her, love her, love her!!! Check out our website for more dogs to adopt! Billy, Linda and Ben are still waitng! We do not re-home with cats and when re-homing with small children we do have to consider each application carefully.